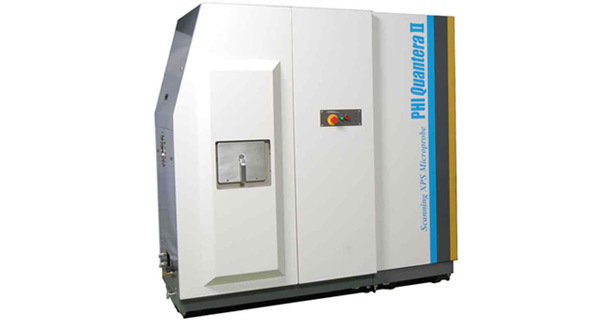 The Quantera II is the latest system in PHI’s highly successful XPS scanning microprobe product range. The Quantera II delivers high sensitivity spectroscopy of large and micro areas, superior organic and inorganic depth profiling, secondary electron and XPS imaging and fully automated analysis of insulating or conductive samples. Micro area spectroscopy and high performance thin film analysis open up new areas of application for XPS surface analysis. The completely automated system is easy to use, with high reproducibility for routine measurements. Large sample platens enable practical analysis of large samples or multiple small samples. 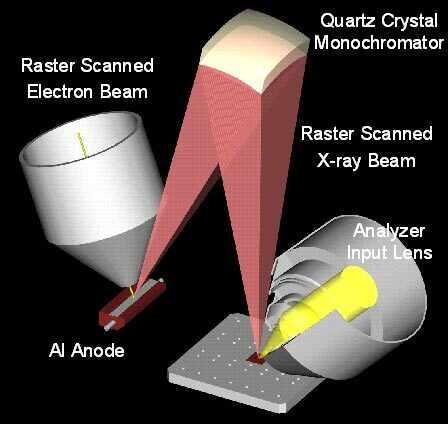 X-ray photoelectron spectroscopy (XPS/ESCA) is the most widely used technique for surface analysis, with many established industrial and research applications. XPS scanning microprobe analysis provides information about quantitative elemental and chemical states in surfaces and thin film structures. XPS is used in applications including polymers, metals, thin films, nanomaterials, semiconductors, magnetic storage media, display technology, biomedical devices and catalysts.